Not Your Sunday Times: Israeli/Egyptian Peace Treaty Violated… Sort of. Israeli/Egyptian Peace Treaty Violated… Sort of. Israel has agreed to let Egypt raise their troop levels in the Sinai Peninsula in light of the protests that have dealt a potentially fatal blow to Egyptian President Hosni Mubarak. Given the tense security situation on Israel's southern border, Egypt can add 800 soldiers to the Sinai Peninsula regardless of the stipulations of their peace treaty. The past week of protests have resulted in prison breaks that have freed thousands of prisoners. Additionally, the influx of security forces to Cairo and Alexandria left the Rafah Border Crossing between Egypt and the Hamas-dominated Gaza Strip unpatrolled. Hamas operatives are reported to have broken into Egypt in order to assist the Muslim Brotherhood in their opposition to [former?] President Mubarak. The late Egyptian President Anwar El Sadat worked with then-Prime Minister Menachem Begin and Peanut Farmer Jimmy Carter to build a peace between Israel and Egypt following four wars fought between the two sides. After conquering the territory in 1967, Israel returned the entirety of Sinai to Egypt in exchange for normalized relations, as well as a promise that the peninsula would remain demilitarized. 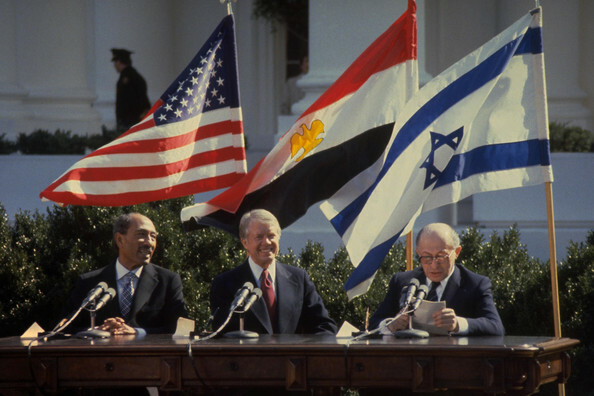 The 1979 Egypt-Israel Peace Treaty, signed at the White House, has been respected for over 30 years. However, the Muslim Brotherhood has said their first order of business if swept into power would be ending the treaty. Given the political instability facing the most populated country in the Arab World, there is ample reason to assume the long-standing peace may be nearing its end.